Tom Underberg lives and works in Evanston, which is basically Chicago if you zoom the map out far enough. He's had a variety of jobs that sound more interesting in a list than they were in real life: bartender, book binder, dishwasher, consultant. Before he started work on his first novel, he published short fiction in magazines like Weird Tales and The Magazine of Fantasy & Science Fiction. He's been claiming he's no more than 10 to 15 thousand words from finishing the first draft of that first novel for a while now, so hopefully by the time we read this bio at Tuesday Funk, the book will be done. Please join Tom and our other amazing readers on Tuesday, December 5, 2017 in the upstairs bar at Hopleaf. Doors open at 7pm, and the show starts at 7:30. It's free, and 21-and-over. RSVP on Facebook. 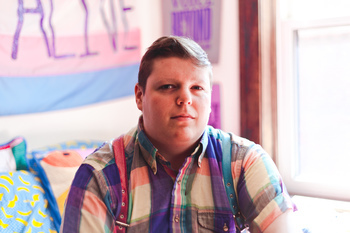 H. Melt is a poet, artist, and educator whose work proudly celebrates Chicago's queer and trans communities. Their writing has appeared many places including In These Times, The Offing, and Them, the first trans literary journal in the United States. They are the author of The Plural, The Blurring and editor of Subject to Change: Trans Poetry & Conversation. Lambda Literary awarded them the Judith A. Markowitz Award for Emerging LGBTQ Writers in 2017. They've also been named to Newcity's Lit 50 list, as well as Windy City Times' 30 under 30. H. Melt co-leads Queeriosity at Young Chicago Authors and works at Women & Children First, Chicago's feminist bookstore. Please join H. Melt and our other amazing readers on Tuesday, December 5, 2017 in the upstairs bar at Hopleaf. Doors open at 7pm, and the show starts at 7:30. It's free, and 21-and-over. RSVP on Facebook. Jasmine Davila has read in venues small- and medium-sized, such as Funny Ha Ha, Feminist Happy Hour, 20x2, Essay Fiesta and this very show. She tweets, tumbls, and instagrams as @jasmined. Please join Jasmine and our other amazing readers on Tuesday, December 5, 2017 in the upstairs bar at Hopleaf. Doors open at 7pm, and the show starts at 7:30. It's free, and 21-and-over. RSVP on Facebook. 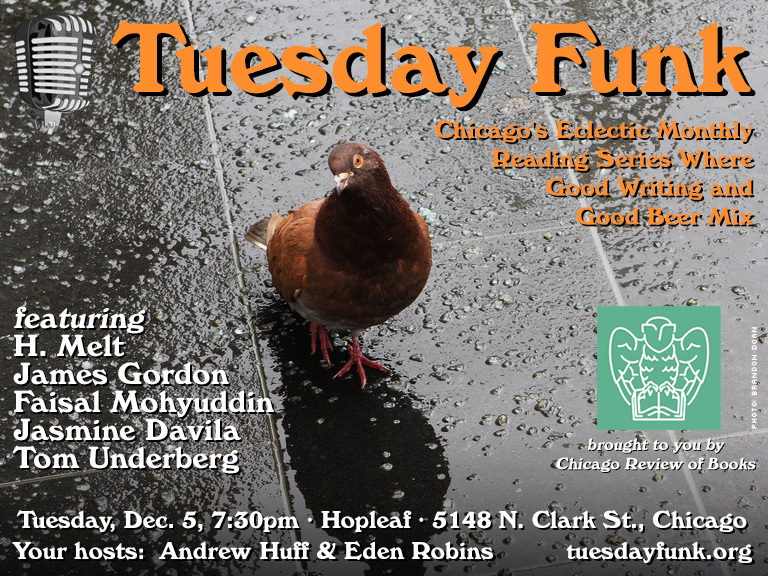 Join us at the Hopleaf on Tuesday, Dec. 5 for another edition of Chicago's favorite eclectic monthly reading series! We'll have readings by Jasmine Davila, James Gordon, H. Melt, Faisal Mohyuddin and Tom Underberg, plus extra treats by cohosts Andrew Huff and Eden Robins! As always, admission is free, but you must be 21 to attend. Doors open at 7pm sharp (don't dawdle if you want a seat!) and the show will start at 7:30pm. Please RSVP on Facebook -- and if you haven't yet, get ready to start the new year right by liking our page so you get our announcements right in your stream. The room at the top of the stairs at Hopleaf filled with expectant audience members, and the 110th edition of Tuesday Funk fully delivered on those expectations! Henri Harps led us off with the tale of a jazz saxophonist who lost himself in the music. Next, Jeff Ruby shared an excerpt from his new middle-grade novel, Penelope March is Melting, then Britt Julious read an essay about trauma and recovery. During intermission, bartender Slim refreshed everyone's drinks, and cohost Andrew Huff brought us back into the show with a found text poem about how to's. 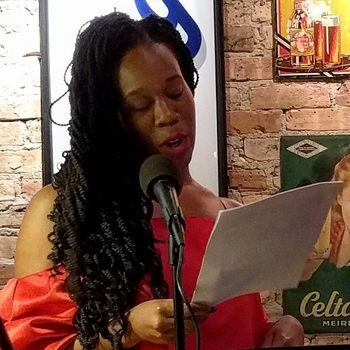 Gint Aras then read a portion of his memoir about racism in Cicero, and Parneshia Jones closed out the evening with a selection of poems, including one that had everyone craving an Italian beef. Fortunately, there was plenty of food right downstairs. We'll be back in the upstairs lounge at Hopleaf on Tuesday, December 5, with readings by James Gordon, Faisal Mohyuddin, Jasmine Davila, H. Melt and Tom Underberg. Hope to see you there! Reminder: Tuesday Funk #110 is tonight! You definitely don't want to miss this amazing show, featuring Gint Aras, Henri Harps, Parneshia Jones, Jeff Ruby, and Britt Julious! Hosted, as always, by Andrew Huff and Eden Robins. 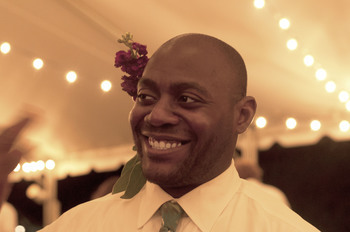 Henri Harps is a guitarist, writer and jazz fanatic born in Washington D.C. After spending nearly a decade navigating the flailing cultural milieu of New York City, he now happily calls Chicago home. He does this along with his wife, menagerie of aging animals, and a continually expanding array of musical instruments. 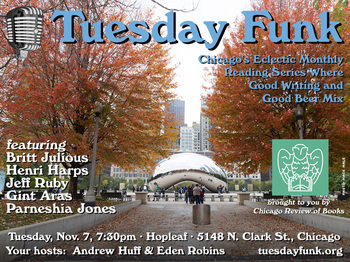 Please join Henri and our other amazing readers on Tuesday, November 7, 2017 in the upstairs bar at Hopleaf. Doors open at 7pm, and the show starts at 7:30. It's free, and 21-and-over. RSVP on Facebook. 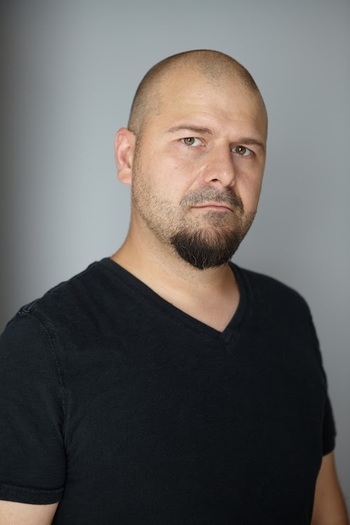 Gint Aras has been trapped on planet Earth since 1973. His prose and translations have appeared in such places as Quarterly West, St. Petersburg Review, ReImagine, STIR Journal, Antique Children, The Good Men Project and other publications. His novel, The Fugue, was a finalist for the 2016 Chicago Writers Association's Book of the Year Award. He lives in Oak Park with his family. 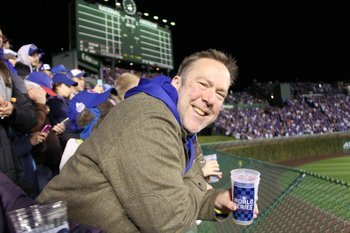 Please join Gint and our other amazing readers on Tuesday, November 7, 2017 in the upstairs bar at Hopleaf. Doors open at 7pm, and the show starts at 7:30. It's free, and 21-and-over. RSVP on Facebook. Parneshia Jones is the author of Vessel: Poems (Milkweed Editions), winner of the Midwest Book Award and an Oprah.com pick for 12 Poetry Books to Savor. 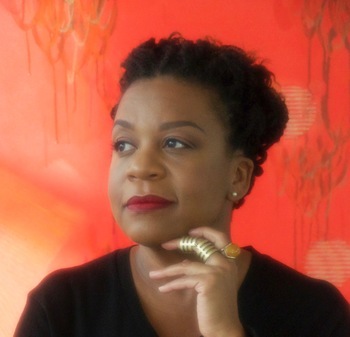 After studying creative writing at Chicago State University, earning an MFA from Spalding University, and studying publishing at Yale University, Jones has been honored with the Gwendolyn Brooks Poetry Award, the Margaret Walker Short Story Award, and the Aquarius Press Legacy Award. Named one of the "25 Writers to Watch" by the Guild Complex and one of "Lit 50: Who Really Books in Chicago" by Newcity Magazine, her work has been anthologized in She Walks in Beauty: A Woman's Journey Through Poems, and The Ringing Ear: Black Poets Lean South, and featured on PBS Newshour, the Academy of American Poets, espnW, and Poets and Writers Live. 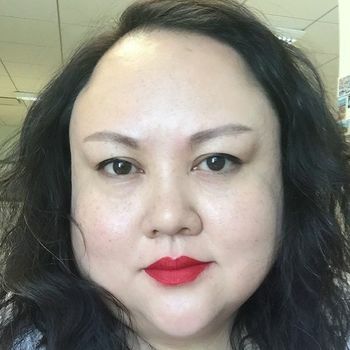 She currently serves as the Poetry Editor for Northwestern University Press/TriQuarterly Books. In addition to her editorial duties, Jones holds the position Sales and Community Outreach Manager, working with communities across the globe on literature focused in the humanities. Please join Parneshia and our other amazing readers on Tuesday, November 7, 2017 in the upstairs bar at Hopleaf. Doors open at 7pm, and the show starts at 7:30. It's free, and 21-and-over. RSVP on Facebook.